Group A on left using iPads, Group B on right reading books. For the past 4 years I have had a leveled reading group time in my classroom with groups of 5-8 children working in small groups with myself or an aide or volunteer.This year with my large class size I was depending on a high school helper to lead one group until one day she withdrew from our school... which left me with 12 students in my reading group. 12 is way too many for a small group so I have felt doubly blessed by having the iPads available. 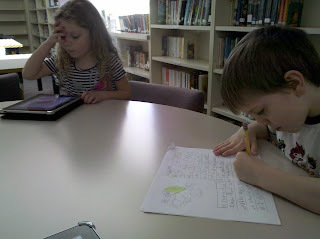 So now, I have half the group use literacy apps on the iPad while I meet and read with the other half. Then we switch. The result: 6 students getting 1:1 feedback support and practice (from the I Pad!) 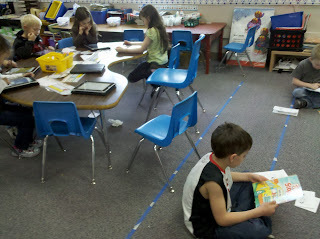 on reading skills while I provide the other 6 with feedback, suport and practice reading leveled books. Some of the apps I use (replacing worksheets/puzzles, etc. that the kids would have to do independently and not have feedback on while they are working) are Make a Word, Montessori Crosswords, Starfall ABC, Louie's Letter Challenge, Teach Me K and 1st grade, ABC Reading, and Pocket Phonics. In past years I've had similar issues (not enough helpers to have small groups) so I have had to spend a lot of time making meaningful materials to use in centers, interrupting the group I'm in to monitor students who should be working on their own, and worrying that the activities I had students doing weren't "good enough." I cannot believe how easy it is to use the iPads as a center, how excited the kids are to use them, and that I so very rarely get interrupted by an iPad user. So what if kids are "playing around?" Put them in the "no Ipads for __ days list." During times you would normally have the student use an iPad have them do the assignment "the old fashioned way." Trust me, they will not be repeat offenders. I won an iPad last year at our district's technology fair. It was only right that I use it in my kindergarten classroom. I have downloaded many children's book and use the iPad as a listening center. I have many apps for language arts and math. The kids enjoy the drawing and painting app also. What apps do you use in class? I know you mentioned a few. I'd love to share. A few parents gave me gift cards to Barnes & Noble and iTunes which he led me get more apps for the kids. Hmm, how do you hint to parents that iTunes cards would make a great gift? Deb, there are so many great apps out there... Check out my posting about "apps for education"... It's my latest attempt at sharing my favorite apps. Theres a form you can use to tell me about your favorites to. Otherwise, use the labels and look at the teaching tools blogs... Those are some of the best I've found so far. Thanks for sharing. Do you use story kit yet? It's free and kids can make their own stories. And I am so glad you are using the iPad in class... Many teachers wouldn't have felt like letting the kids use it. Did you turn off delete and add apps in settings? My kids know the shaking apps are BAD! We are just getting iPads into our Prep School in Australia. A good story kit we have found is Play School Art Maker by Australian Broadcasting Corporation. It allows you to choose many backdrops and characters and then record your voice to actions. I love your blog and all the ideas you share. I am a new follower! I'm loving your ideas and your blog! Thanks so much!